Here are three photos shared by Charles W. Ray Jr. and Manford Sheridan and his sister, Deloris Sheridan Heitz. Marjorie Noel Range and Violet Adams Campbell have helped with many identifications. 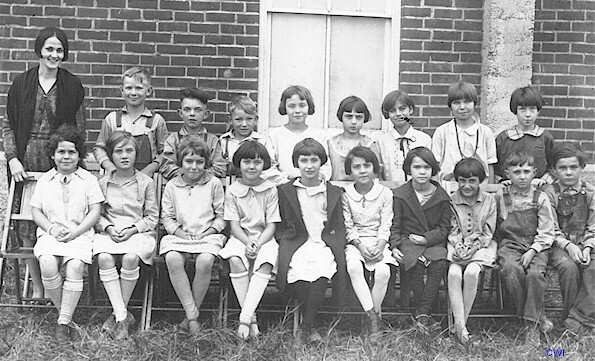 This 1927 photograph was taken of third and fourth grade classes at Bronaugh. 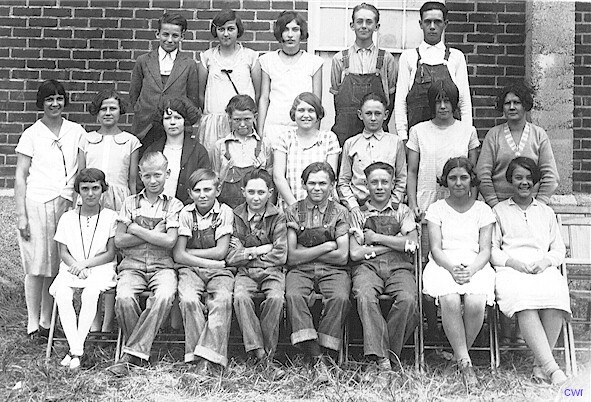 Bronaugh students pictured are, front row from left: Euleta Wilson, Blanche Stark, Violet Adams, Ona Moore, Deloris Sheridan, Dixie Lee Linn, Marjorie Manley, Marie Ella Townson, Dean Garton and Leonard Manley. Back row Miss Lee Earl Thompson, Norval Campbell, Max Smith, Harold White, Mildred Smithly, Claudia Roberts, Marjorie Noel, Louise Musgrave and Jeanetta Nuckolls. 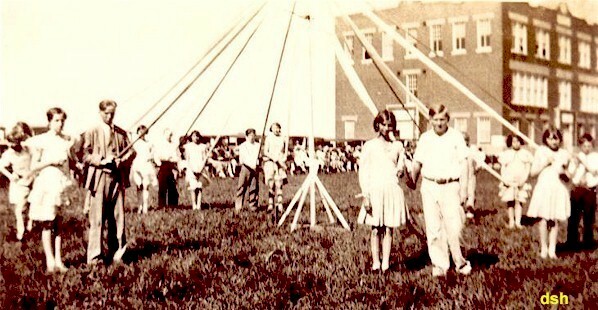 On the 1936 web page, you can find photos of some of these students when they graduated from high school. Identifications from Bushwhacker Weekly Magazine, Vol.2--No. 13, Wed, May 13, 1981, Nevada, Missouri 64772 - REMEMBER WHEN.... The picture was brought to The Bushwhacker by Mrs. Clarence (Euleta Wilson) Foreman, Rt. 1, Horton. Corrections by Deloris Sheridan. Front Row: Betty Post Garton believes that front row left is her mother, Neva Ames. (Although the photo had her identified as a Martha Moore). Beside her is Dean Thomas. Fourth from left appears to be Wendell Garton. 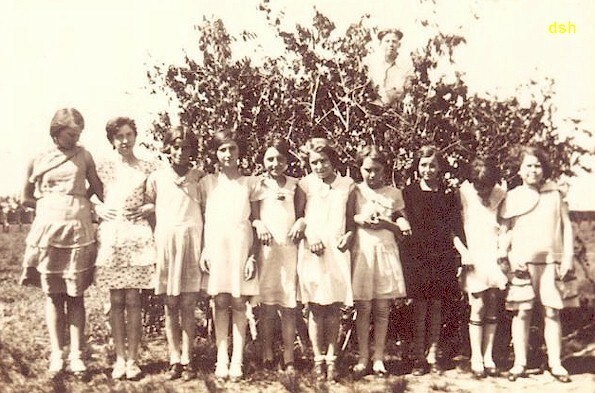 The teacher (2nd row left) is Dicy Feller. Boy in overalls in the middle row appears to be Martion Irwin. 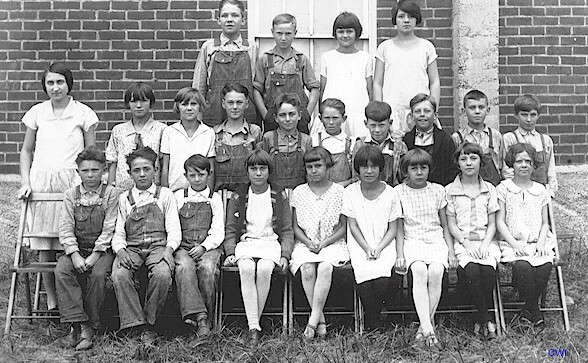 Paula Pruitt says back row, second from the left is WYNONA FELLER (SHAW). Beside Wynona appears to be Odie Justis. 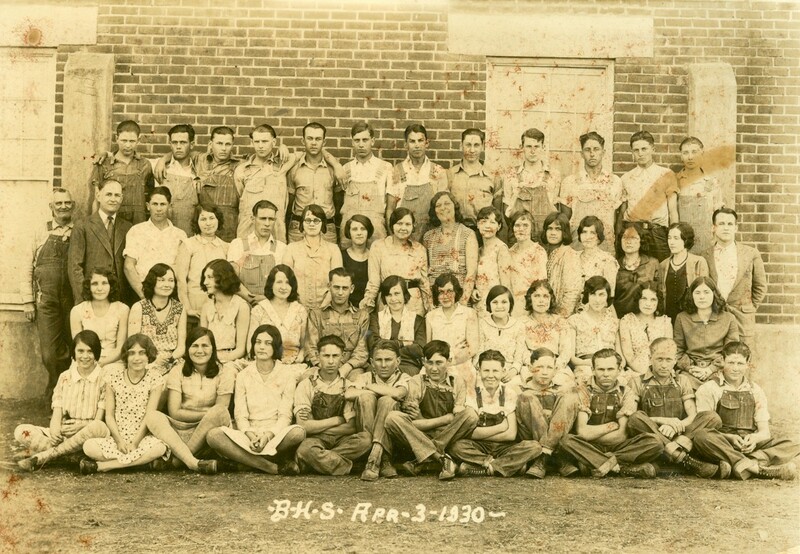 Devin Haynes identifies the young man on the far right of the top row as Merle Shearburn. If you can identify anyone else, let us know.